You go into your local drycleaning store, drop off your clothes, get your ticket, then drive away. A clothesonconveyorfew days later, youDrycleaning return, pick up your clothes, pay the customer service representative, and drive away again. But, do you know what happened to your clothes while they were at the drycleaning shop? Do you know what drycleaning is and how it works? Drycleaning dates back to ancient times, probably beginning with the advent of textile clothing itself. The ruins of Pompeii gives a record of a highly developed trade of "fullers" who were professional clothes cleaners. Lye and ammonia were used in early laundering, and a type of clay known as "fuller's earth" was used to absorb soils and grease from clothing too delicate for laundering. 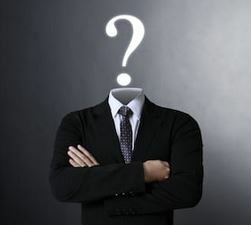 There are many stories about the origin of drycleaning, all centering on a surprise discovery when a petroleum-type fluid was accidentally spilled on a greasy fabric. It quickly evaporated and the stains were miraculously removed. The firm of Jolly-Belin, opening in Paris in the 1840s, is credited as the first drycleaning firm. In spite of the name, drycleaning is not completely dry. Fluids are used in the drycleaning process. In the early days, garment scourers and dryers found several fluids that could be used as drycleaning solvents, including camphene, benzene, kerosene, and gasoline. These fluids are all dangerously flammable, so drycleaning was a hazardous business until safer solvents were developed. In the 1930s, percholoroethylene or perc (a nonflammable, synthetic solvent) was introduced and is used today in many drycleaning plants. Other cleaning solvents have been added, these include most predominently hydrocarbon, Green Earth and others are currently being introduced and tested. Drycleaning is not the answer to all soil and stain removal problems. Sometimes, stains become permanently embedded in the fiber, or fabrics cannot withstand normal cleaning and stain removal procedures, or decorative trim is not compatible with drycleaning solvent. It is important that consumers as well as drycleaners read all care labels and follow the instructions. There are various makes/models of drycleaning machines. Despite the differences, all drycleaning machines work on the same principle. The holding tank holds the drycleaning solvent. A pump is used to circulate the solvent through the machine during the cleaning process. Filters are used to trap solid impurities. 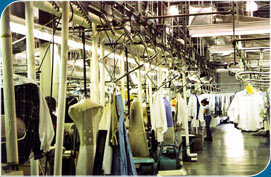 A cylinder or wheel is where the garments are placed to be cleaned. The cylinder has ribs to help lift and drop the garments. The operation of the drycleaning machine is easy to understand. The solvent is drawn from the tank by the pump. The pump sends the solvent through the filters to trap any impurities. The filtered solvent then enters the cylinder to flush soil from the clothes. The solvent leaves the cylinder button trap and goes back to the holding tank. This process is repeated throughout the entire cleaning cycle, ensuring that the solvent is maintained to give effective cleaning at all times. After the cleaning cycle, the solvent is drained and an extract cycle is run to remove the excess solvent from the clothes. This solvent is drained back to the bare tank. During extraction, the rotation of the cylinder increases in order to use centrifugal force to remove the solvent from the clothes. Once the clothes have finished extracting, the cylinder stops. At this time, clothes are either transferred to a separate dryer or, on most machines, dried in the same unit, a closed system. The drying process uses warm air circulated through the cylinder to vaporize the solvent left on the clothes. The solvent is purified in a still. Here the solvent is heated. The vapors are then condensed back to a liquid leaving behind all impurities in the still. This clean solvent is then pumped back into the holding/base tank. Drycleaning machines are rated in pounds of fabric (dry weight) the machine can hold. Machine sizes vary from very small (20 pounds) to large (100 pounds) capacity of clothes cleaned per cycle. Before cleaning, garments are inspected and classified. The length of the cleaning cycle is dependant upon the type of article cleaned and the degree of soiling. Some heavily stained garments may go through a stain removal process prior to cleaning to aid in better soil and stain removal. A stain removal technician will treat specific items just prior to cleaning. A lot of effort goes into the process, and there are many skilled technicians involved in caring for your garments. Now, when you visit your drycleaner, you will have a better understanding of this "magical process" of drycleaning.